Spectrometry can be defined as a technique used in the determination of compounds and elements by measuring the radiations emitted by an object or substance within a defined electromagnetic spectrum when the object is subjected to excitation externally by other source. Spectrometry technology plays a pivotal role in life science and analytical industry. It is used in wide range of applications however some of the notable areas of applied spectrometry instruments comprises of industrial chemistry, pharmaceuticals, food & beverages testing, biotechnology, environmental testing, along with astronomical and defense sector. Growing demand for drug composition and bimolecular analysis from life sciences and bio technology is expected to drive the demand for spectrometry during the period of study. Geographically North America dominated spectrometry market driven by higher usage in the food & beverage industry and higher R&D activities in the field of biotechnology in the region. North America was followed by Europe and Asia-Pacific as second and third largest market for spectrometry market. Asia Pacific is projected to have fastest growth, owing to rapidly growing food & beverage industry and increasing number of biotechnology and pharmaceutical players in developing nations such as China, and India in this region. This report identifies the global spectrometry market size in for the year 2014-2016, and forecast of the same for year 2021. 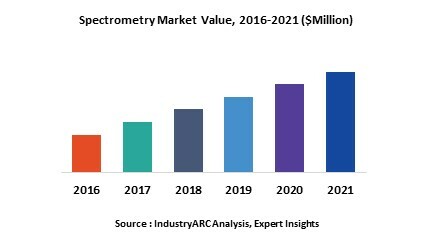 It also highlights the market drivers, restraints, growth indicators, challenges, and other key aspects with respect to global spectrometry market. 15.9. Thermo Fisher Scientific, Inc.